Don’t add yeast, baking soda, store bought septic chemicals, and bleach. The natural bacteria in your tank lives at a certain pH level. The bacteria eats waste and it is separated into water and solids. If you change the pH level of the bacteria it will die, and will not separate the water and solids and your tank will fill up and also produce a septic smell. Yeast does not provide the needed bacteria in your tank. It simply ferments what is in there. Baking soda changes the pH level in the tank, thereby killing the bacteria. Store bought septic chemicals can also change the pH level and do not provide “live bacteria” to your tank. Bleach can change the pH level if used in large quantities, used sparingly, it will not affect the bacteria. ● Don’t flush any combination of the following down the toilet: hair, diapers, baby wipes, wipes of any kind, cigarette butts, condoms, sanitary napkins, tampons, paper towel, table napkins, cat litter, paint, grease, oil or any type of chemical. All of these are not digestible by the bacteria. They will all float on the top of the tank and will clog the tank, blocking the outlet baffle to your leach field, possibly entering your leach field and will produce expensive problems. JCL Septic Service suggests that products that say they are safe for septic systems and are biodegradable also not be flushed down the toilet. Some products that are biodegradable need sunlight to break down. There is no sunlight in a septic tank, and therefore the product will not break down. ● Don’t do an excessive amount of laundry all in one day. This will over load the tank with water and thereby overload the leach field. There is a higher tendency to back up into the house because the water can only drain from the leach field at a certain rate to not saturate the ground. Space the laundry out over the week instead. Don’t use laundry detergent high in phosphorous. Powder detergent tends to clump together and can cause a blockage in the pipes. Liquid detergent is better. Don’t flush large amounts of toilet paper down the toilet. Children tend to do this more often. Large amounts can cause a blockage in the pipes as well as in the inlet baffle to the tank, causing back ups into the house. 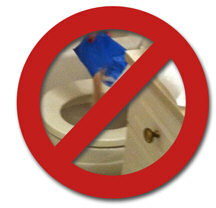 Children should also be told not to flush toys down the toilet as well. Don’t build any decks, additions, sheds, other buildings or driveways over the septic tank. This will prevent access to the tank and ultimately, if the tank needs to be replaced, it can not. Do set up a pumping schedule so that any problems with the system can be found early and fixed before they become larger and more expensive problems. If the outlet baffle falls off, waste will automatically flow into the leach field thereby clogging the leach field pipes and preventing water from flowing out. The field will eventually fail if this is not fixed. Do become knowledgeable about your septic system. Ask us any questions and we will be glad to answer them to the best of our knowledge. Do check for any leaking faucets or shower heads. This adds constant water into your tank besides every day water usage. Filling your tank with too much water, again causes strain on the leach field drainage. Do call JCL Septic Service if your toilets, sinks or showers begin to drain slowly, or start making gurgling sounds, or if you begin smelling sewage, it may mean your tank needs to be pumped and/or there is the beginning of a blockage in the pipes that needs to be removed. Choose a reliable septic service company that delivers the quality and professionalism you expect. Serving the Antrim, Bennington, Francestown, Greenfield, Hancock, Harrisville, Marlow, Munsonville, Nelson, Peterborough, Sharon, Sullivan, and Temple areas of the Monadnock region.